Leonardo Da Vinci. A biography by Walter Isaacson. I knew Leonardo Da Vinci was a great painter and a brilliant inventor, but I really had no idea of how curious and brilliant he was until I read this book. 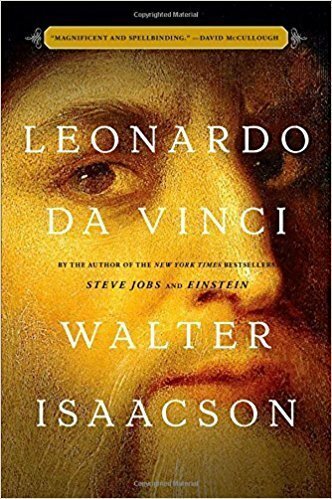 Walter Isaacson does a great job of taking you through Leonardo’s life and gives an insight into this amazing man who was curious beyond belief and possibly a little ADD or ADHD. He never finished a book. He often did not finish paintings. He carried the Mona Lisa around with him for 13 years…adding a touch here…a brush stroke there until his death. His list of unfinished paintings and projects is extensive. This book was tough to put down. I could not wait to read more and learn what else this genius would do next. His engineering ability, painting, sculpting, and interest in hydraulics, and just about anything else he could get his hands on, is incredible. His interest in anatomy was what made his paintings of people and animals so authentic. So many of his notebooks had things designed and drawn out and would become reality 100’s of years later…because he never published people had to figure things out later on their own. I highly recommend this book for the curious mind because Leonardo was certainly one of the greatest curious minds. Oh yeah, Da Vinci is not his last name. He was Leonardo “from the city of” Vinci.